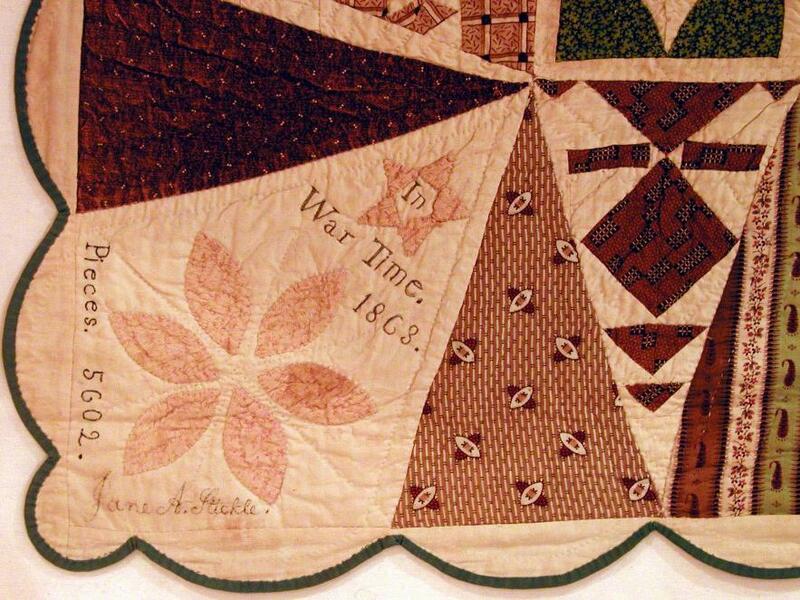 In 1863 a woman named Jane A. Blakely Stickle completed a sampler quilt. Her name would be unremarkable today except for one thing that she did; she signed her amazing quilt. "In War Time. 1863. Pieces. 5602. Jane A. Stickle." The quilt was passed down through the family. During the depression years a relative in St. Louis, Missouri found the signed quilt and knowing Jane was from Vermont sent it to the Bennington Museum. The museum is one of the finest art and history museums in New England and well known for the largest collection of Grandma Moses paintings and memorabilia. The quilt appeared in Lady's Circle Patchwork Quilts magazine, Winter 1983 issue which featured quilts and quilters from the state of Vermont. Jane's quilt was shown draped from a bowfront chest so it was not seen in its entirety. But what really put it on the road to becoming world famous was when it was pictured fully in Richard L. Cleveland & Donna Bister's book Plain and Fancy: Vermont's People and their Quilts as a Reflection of America, published in 1991. That is where and when Brenda Papadakis saw "The Quilt". The geometry of the block designs quickly captured Brenda's attention. She spent the next five years researching Jane Stickle's life and times. 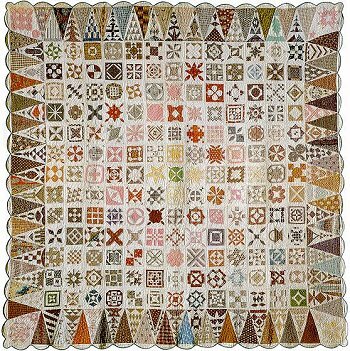 She drafted the patterns of the 169 four and a half inch blocks, the 52 triangle border blocks, and the 4 kite-shaped corner blocks and then published those in the book Dear Jane, The Two Hundred Twenty-Five Patterns from the 1863 Jane A. Stickle Quilt. Later she made the Dear Jane®; CD Rom available making it possible to customize one's own version of the quilt from a computer. Thanks to Jane signing her quilt - thus the quilt being returned to the state of Vermont where they have great documentation of their historical quilts, thanks to Brenda publishing her Dear Jane® book, and thanks to the internet and the Dear Jane® website thousands worldwide know Jane Stickle by name today.